Go to the little icon on the top with your profile picture and navigate to settings. 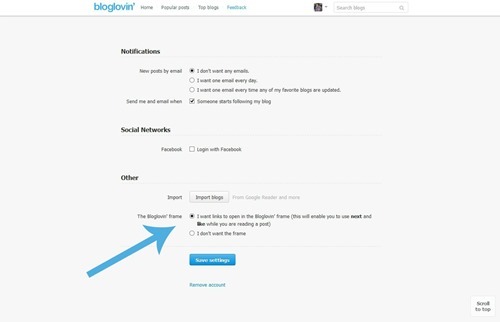 On the setting screen, choose “I want links to open in the Bloglovin’ frame (this will enable you to use next and like while you are reading a post)” as shown by the arrow below. 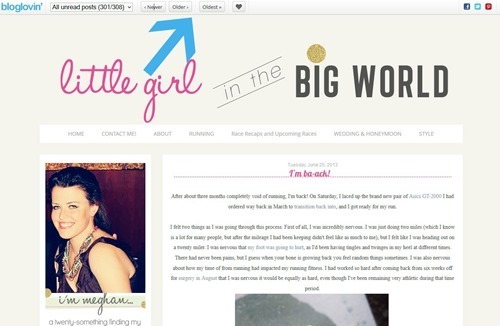 Now, go to the bloglovin home screen. Click on the name of the blog post you want to read (not the name of the blog itself, but the post name). It will open in a new tab. Now, on the top of the post that opened, you will see a toolbar. I usually choose oldest (just read the post that you opened first, otherwise it will be marked as read and you can’t get it back) and then I click on newer each time I want to go to a new post! As you can see, I am currently reading post number 301 with 300 more unread posts to go! 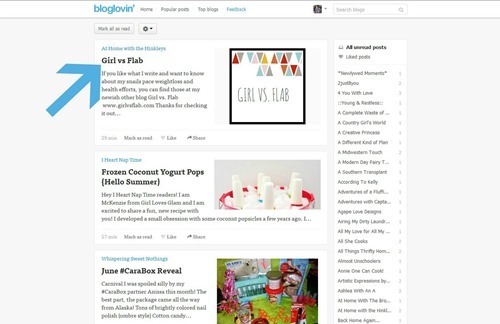 I hope this was helpful to someone starting out with bloglovin, as everyone continues to worry about Google Reader closing on Monday!